Working closely with multiple landowners for several years, CDLT has now protected 90 acres, including 7,000 feet of streambank and an alcove that was the former main channel as recently as 1975. The land along Nason Creek has been heavily impacted by Highway 2, the railroad, and two sets of power transmission lines. Despite these impacts, this reach has the highest number of Spring Chinook spawners in the entire Wenatchee Basin, and the most steelhead redds other than the Chiwawa River, making habitat protection a very high priority. This area of Nason Creek has been the focus of considerable salmon recovery efforts by both the Yakama Nation and Chelan County. Former property owners Stone and Sharlynn Parker said, “We are delighted to have such a significant open space project in our neighborhood and to have been a part in creating it. We wanted to see this wildlife corridor remain as is, and full of things to enjoy." 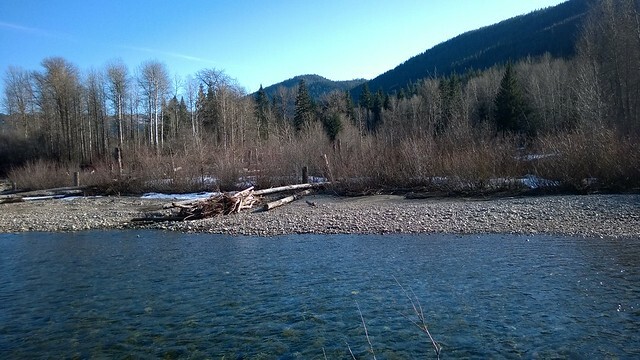 Easily accessible from Highway 2, our Lower White Pine property on Nason Creek offers a chance to stroll through tall conifers and view spawning Chinook and steelhead from the bank of this important spawning ground. Birding is excellent. Visitors can also view the historic alcove which was once the river's main channel and may one day be reconnected. Occasionally, mountain goats can be seen on the towering cliffs flanking the creek. This property is adjacent to a private home. Please heed all no trespassing signs. While the bridge over the alcove is publicly accessible, please do not step off the bridge to the east. There is no easy access to the southeast section of this property, which includes the restoration projects. Directions: Driving west on Hwy 2 from Leavenworth, pass Cole’s Corner and drive 5 miles. You will see a driveway to a home on your left. 1/10th of a mile past this driveway is a gravel road, also on your left. Parking is available at the end of this short gravel road, or along the shoulder of Hwy 2.